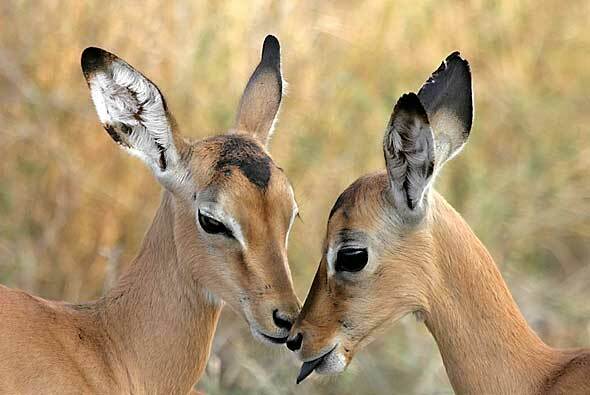 Photo Details: Impala fawns (Aepyceros melampus) appear to rub noses as they nuzzle each other, Kruger National Park, South Africa. The two were part of a nursery of about a dozen impala babies, born shortly before we visited the Kruger Park during December. Camera: Canon EOS 400D; Lens: Canon 100-400 IS Zoom; Focal Length: 320mm; Shutter speed: 1/400; Aperture: f5.6; ISO: 400. Did you know? The Kruger National Park is the largest wildlife sanctuary in South Africa, covering an area of 18,989 square km (7,332 sq miles). Check your safari knowledge by taking our light-hearted African Safari Quiz. If you prefer, you can first go through the questions and answers with accompanying information by reading the Safari Quiz Answers. A reminder to nature and wildlife photographers - time is running out to enter The Nature Conservancy's Annual Photo Contest. Entries are accepted from all over the world and you do not need to be a member of The Nature Conservancy to enter - but entries must be in by October 15, 2008. Similar to the more than 25,000 entries submitted since the first contest in 2006,The Nature Conservancy is looking for beautiful nature photography representing the diversity of life on Earth - including forests, grasslands, lakes, rivers, deserts, rainforests, oceans, coral reefs, and more! The winner's image will be printed in the 2010 Nature Conservancy calendar - reaching nearly 2 million households worldwide. All submitted images are eligible to be displayed on nature.org, as well. 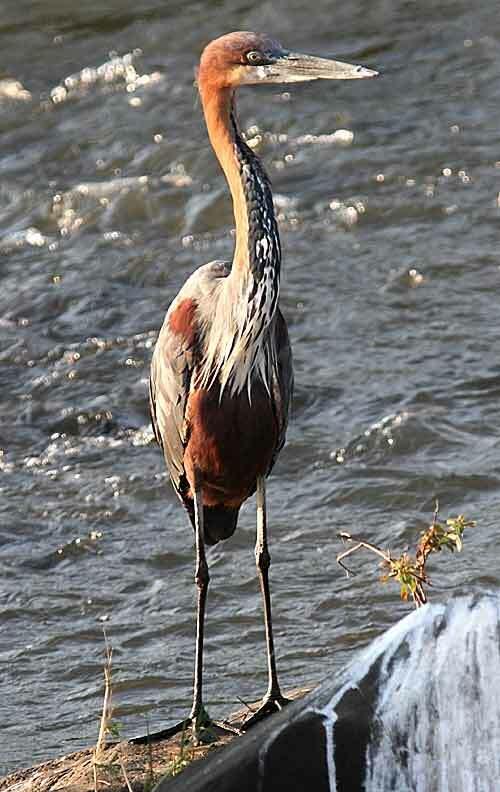 Photo Details: Goliath Heron (Ardea goliath) takes a break after a spell of wading and hunting for food in the fast-flowing Sabie River, near Lower Sabie Rest Camp, Kruger National Park, South Africa. Camera: Canon EOS 400D (Digital Rebel XTi); Lens: Canon EF300mm F4 IS USM plus 1.4 converter; Focal Length: 420mm; Shutter speed: 1/400; Aperture: f5.6; ISO: 400. Photo Details: Redbilled Oxpecker (Buphagus erythrorhynchus) on the shiny rump of an impala, Kruger National Park, South Africa. Camera: Canon EOS 400D (Digital Rebel XTi); Lens: Canon EF300mm F/4 IS USM plus 1.4 converter; Focal Length: 420mm; Shutter speed: 1/800; Aperture: f/5.6; ISO: 200. Additional Info: Redbilled oxpeckers seem to appear more frequently than other bird species on this blog, not only because they make colorful subjects with their bright red bills and yellow eye-wattles, but also because they're relatively easy to photograph. 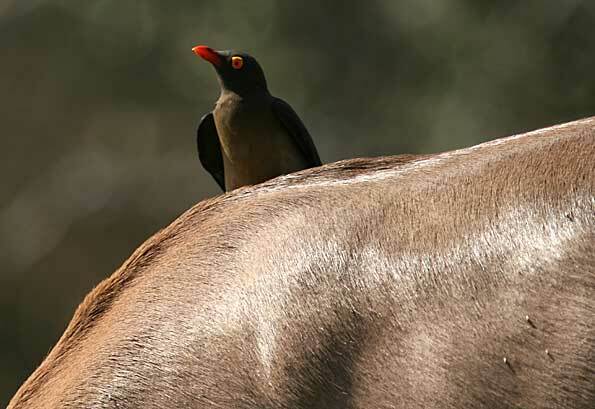 When clinging to the hide of the host animal, oxpeckers are less prone than most birds to flit around or fly away just as you're about to press the shutter. And, because the animals will often be grazing in open grassland, you have the added benefit of uncluttered backgrounds. In the picture above, the background foliage is far enough away to be thrown totally out of focus, making the dark subject stand out more clearly. In this case I used a Canon 300mm F/4 image-stabilised lens with 1.4 converter, giving a focal length of 420mm. This is a great little lens (well, little when compared to a 300mm F/2.8). It's light, compact and, when coupled with a 1.4 converter, easier to hand-hold than a normal 400mm lens. It's also not hugely expensive, so is certainly a recommended option when selecting a lens for wildlife photography. We're running a special on our Photo Packs. If you buy any two Photo Packs ($20 total) before 31 December, you'll get another eight packs of your choice (value $80) absolutely free! That means, for just $20, you get $100 worth of royalty-free images (150 pictures in total) that you can use for your websites, print publications, artwork, etc. See Wildlife Photo Packs for more. Photo Details: Close-up of small-spottted genet (Genetta genetta) out at night foraging for food, Satara Rest Camp, Kruger National Park, South Africa. Camera: Olympus C2100 UZ; Shutter speed: 1/200; Aperture: f3.5; ISO: 100. 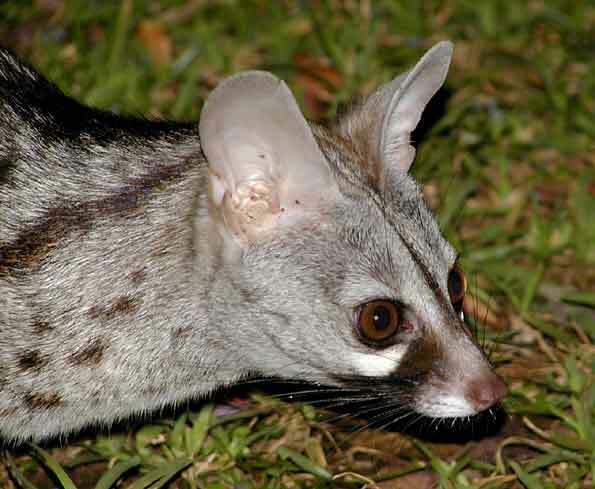 Additional Info: The small-spotted genet differs from the large-spotted genet (Genetta tigrina) not in physical size, but in the size of the spots. The two types can usually be told apart by the tail - the large-spotted genet, in addition to its larger spots, has a black-tipped tail, while the small-spotted genet's tail has a tip that is a paler, buffy white color. The above picture was taken some years ago using a 2 megapixel Olympus digital camera with 10x image-stabilized zoom lens and built-in flash. Today's equivalent is the Olympus SP-570UZ, boasting 10MP and an image-stabilized, 20x zoom lens. How technology marches on! 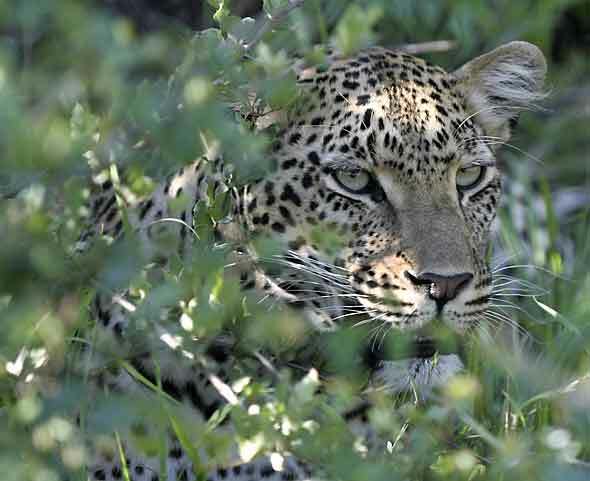 Photo Details: Leopard (Panthera pardus), only its head visible, keeps watch while hiding in thick bush, Elephant Plains Game Lodge, Sabi Sand Game Reserve, South Africa. Camera: Canon EOS 400D (Digital Rebel XTi); Lens: Canon EF80-200mm F/2.8; Focal Length: 200mm; Shutter speed: 1/500; Aperture: f/2.8; ISO: 400. The lens I used for the above photograph is an old Canon 80-200mm F2.8, known as the "magic drainpipe" because of its black color and superb optical performance. It was released in 1989 and replaced some years later by the Canon EF70-200mm F/2.8 IS USM. The latter has become a legend in its own right and has the added advantages of a USM motor for fast and silent focusing, image-stabilization (IS) and the ability to use Canon's 1.4x and 2x converters. The main disadvantage of the "magic drainpipe" for wildlife photography is the lack of IS, so you need a beanbag or other support to keep it steady, while the focusing is slower and noisier. In addition to the EF70-200mm F/2.8, Canon's EF70-200mm F/4 USM is also a great lens that's highly rated by users. It's smaller and lighter than the 2.8 and, at around $600, a lot less expensive. There's also an image-stabilized version that costs around $1,000.